Creative TravelSound i80 For The iPod Nano | OhGizmo! Even though their own ZEN line of MP3 and media players have been well received, it’s obvious that Creative is not willing to miss out on the opportunity to profit from the incredibly popular iPod. 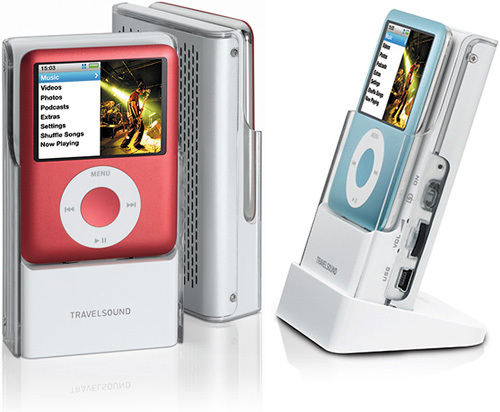 The TravelSound i80 for the latest generation iPod Nano is pretty similar to the company’s i50 model, which was designed for the iPod Shuffle. However, the i80 Nano model only appears on the Creative ASIA website at the moment, which is kind of odd. It’s basically a portable speaker that serves as a hand-held dock for the Nano. On the back you’ll find the decent sized speaker itself, which is powered by 4 micro drivers and a Class D digital amplifier. Since it’s a powered speaker it will probably be as loud as you’ll ever need, but that also means it’s limited to about 15 hours of use with the rechargeable battery. But as an added convenience there’s a USB port which can not only be used to recharge the battery and the Nano at the same time, but can also be used to sync with iTunes without having to remove the iPod. It should be available before the Summer for about $130, and I can only assume it will be getting a worldwide release. Cool! This explains why iPod is still the No.1 most popular device. They look cool! I want one.